The Ecosystem Functions Model (HEC-EFM) is designed to help study teams determine ecosystem responses to changes in the flow regime of a river or connected wetland. 3) use of Geographic Information Systems (GIS) to display results and other relevant spatial data. Through this process, study teams will be able to visualize and define existing ecologic conditions, highlight promising restoration sites, and assess and rank alternatives according to predicted changes in different aspects of the ecosystem. 3) it can be applied quickly, inexpensively, and can incorporate expert knowledge. HEC-EFM is also a generic software tool, applicable to a wide range of riverine and wetland ecosystems. * HEC-EFM download link provides gnu general public license version of the software. HEC-ResPRM is a reservoir system operations optimization software package developed to assist planners, operators, and managers with reservoir operation planning and decision-making. The Hydrologic Modeling System (HEC-HMS) is designed to simulate the complete hydrologic processes of dendritic watershed systems. 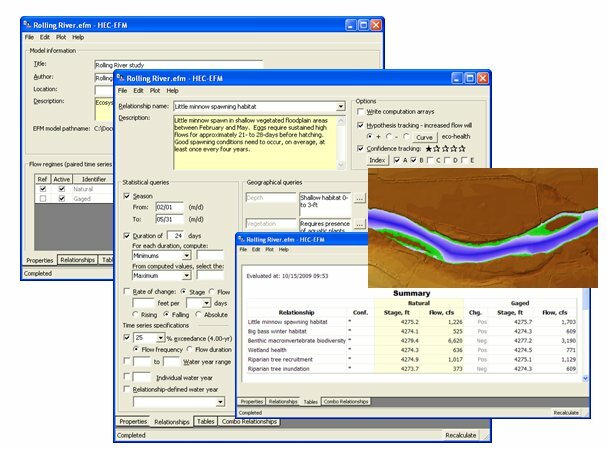 The Reservoir System Simulation (HEC-ResSim) software is used to model reservoir operations at one or more reservoirs for a variety of operational goals and constraints. The HEC-FIA Flood Impact Analysis software package analyzes the consequences from a flood event. HEC-RAS is designed to perform one-dimensional hydraulic calculations for a full network of natural and constructed channels. No one has rated HEC-EFM yet. Be the first to rate this product. Processing Modflow version 5. 3 is included in the first edition of the book 3D-Groundwater Modeling with PMWIN published by Springer-Verlag. Aquifer test analysis is an integral part of groundwater modeling, supplying critical hydraulic parameters to the model or other basic groundwater calculations. The Flood Damage Reduction Analysis (HEC-FDA) software provides the capability to perform an integrated hydrologic engineering and economic analysis during the formulation and evaluation of flood risk management plans.